Listen to the RWJF First Friday Google Hangout to learn how to help nurses reach their potential. The answers often include trauma, including physical or emotional abuse, or other adverse childhood experiences that highly correlate with chronic disease. A study of its patients conducted by the clinic found that nearly half had four or more such experiences in their lifetimes. Close to 4 in 10 of the adult women had been sexually abused before age 18. The clinic also focuses on emotional healing, embracing the Sanctuary model of trauma-informed care. Through art therapy, mindfulness, meditation, and other techniques, it helps patients manage the effects of toxic stresses and move beyond them. To highlight other innovative care models, RWJF will soon recognize a group of 10 nurses who are working to build a Culture of Health in their communities. 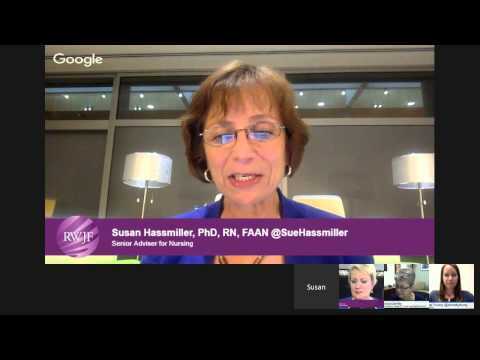 Susan Hassmiller, RWJF’s senior adviser for nursing, says the Foundation sought out nurses who pay attention to what is going on in their communities in order to understand the social determinants of health that are impacting the health of their patients. RWJF and AARP will also push forward on the Future of Nursing Campaign for Action, which Hassmiller directs. The ten-year campaign, now at its halfway mark, seeks to boost nurses’ levels of education, and make certain that they can practice to the full scope of their education and training nationwide. As part of that effort, the Campaign for action is working to make sure that nurses are included on boards of directors of health-related organizations across the country. American Hospital Association data show that the share of nurses on hospital boards was five percent last year, down from 6 percent in 2011. Last year 21 organizations, including RWJF, came together to form the Nurses on Board Coalition, which aims to get 10,000 nurses on boards of directors by 2020. Nurses, of course, can lead at all levels and in a myriad locations, whether in a posh hospital boardroom or inner-city Philadelphia. They just need to be given the chance.